I hope everyone is having a good Sunday! I wanted to talk about something that I talk about a lot in life, but not much in my blog. How impressed I am with writers. While I love to read, review, and edit, I am not a writer. I can look at someone’s work and see how it can be improved, but when it comes to writing stories myself, it has never been something I am interested in or something I have tried to do outside of a classroom. I am not impressed with every writer ever, but I am impressed with writers who know their craft. They know the market. They have excellent grammar. They write, and rewrite, and rewrite their rewrites until things are as perfect as they are going to be. Seeing a manuscript develop is a wonderful thing. And now for the main part of my post – I am going to brag about my husband a little. Okay, a lot. He is a teacher and a writer. He is not published yet, but he does have an agent and they are about to begin sending out his second book (which is actually the first one he wrote) to editors. That book is really cool to me because he began writing it when we had been together for not very long, so I have seen every edit. He sends me his books a chapter at a time, then sends his rewrites. I am putting the most recent version on my Nook this weekend and look forward to reading his changes that he made in the round with his agent. The book is so different from that first draft. He is an excellent writer and knows his craft, but he also knows how to take criticism and make it better. There are times he sends me a chapter and I say “No, this doesn’t work, you need to start again”. He writes 60 pages of a book and we talk about it and he sees it isn’t working, so he puts it in a folder. He looks in that folder years later and figures out how to make the story works and starts again. He fixes his flow, he improves his characterizations, and he does it with not much direction. He has written six manuscripts and has four others (I think there may be one more) in various stages so far. Yes, that is ten ideas in just six years. Ten good stories that are original and well-thought-out with great characters. Six of those that are complete. It amazes me daily that he can do it. It isn’t always easy, finding an agent is tough and sending to editors is juts as tough. It can be discouraging and it can bring us both down. But he keeps writing these incredible stories. It isn’t something anyone can do. I know he will find an editor for one of his books. He is too good not to. He is too creative not to. He is too hard working not to. My husband is a writer, and he impresses me with every chapter he sends my way. I cannot wait for the day that I get to tell you all he has a publisher. What writers impress you the most? Happy Sunday everyone! I hope you are all having a good long weekend! I have been off since Friday, I took a vacation day so I could spend some extra time with my husband and it was really nice. I needed that day off. I thought I would catach up with random things! Fahrenheit 451 by Ray Bradbury which I am currently reading and loving! I can’t believe it took me so long. Every few pages I have to stop and think about what i am reading. Persuasion by Jane Austen – I am planning on reading this, it is on my list! The Blind Side – I read the first chapter but it is more about football than the story, so I took it back. One for the Money – I will try this one. I haven’t read any of the Stephanie plum books, so might as well try one! Abraham Lincoln – While i am interested in history, the level of this particular version was a little simple, so I am taking it back unread. A Room With a View by E.M Forster – was reading this on my ereader and wanted to actually read it faster, so I got it out of the library too. The Moon and More by Sarah Dessen – the ARC is on my shelf and I really want to read it right now, but then there is no more Sarah Dessen so I am waiting a little longer. Beautiful Days by Anna Godbersen – this is the sequel to Bright Young Things which I adored so much that I got the next book the very next day. I just need to get to it! What are you reading? What are you looking forward to? Let me know in the comments! I chose this book as my next Christie because it fit one the categories for the What’s In a Name Challenge. I thought I would like it. 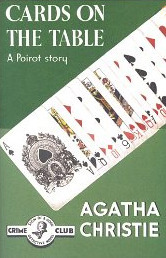 i didn’t expect it to be the best Christie mystery I have read so far. The set up is amazing. There are five people in a room, four are playing bridge and the other is sitting by the fire. In another room, four people involved with investigations. When they come in to say goodnight to the other group they find the host dead. No one else had been in the room and the host believed that all of the others had committed murder before. The format of the book was really great too. Each suspect got interviewed by the Superintendent in one chapter, then the four investigators talk. Each suspect is later investigated more, with different groupings coming together on both sides. It is really a detective story where you have no idea who did it because all of them could have . They way they figured it out was just great. It made perfect sense and the journey to that point was an exciting one. If I knew more about bridge, maybe I could have figured it out, but it didn’t bother me. This is a truly unique mystery and I loved every moment of reading it. 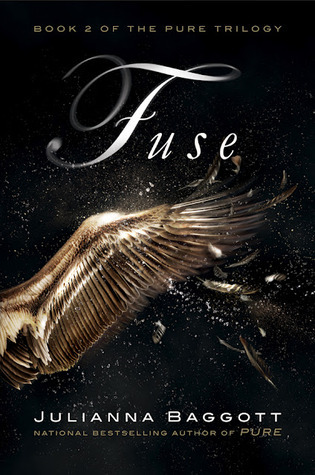 Fuse by Julianna Baggott Giveaway! I really loved this book and you can check out my review over here. The publisher sent me a hardcover of the book to give away to one of my lucky readers! I ma so excited that someone else will get to read it. United States and Canada only. Giveaway ends at noon on 2/13. Winner has 48 hours to respond to my email letting them know they won with their shipping address. +1 extra entry for tweeting about this giveaway – tell me about it in your comment and make sure you include the url of your tweet or it doesn’t count! I adored the first book in this series Pure, but I was nervous this couldn’t live up to it or it would suffer from the biggest middle book issue: just a setup for the final book in the trilogy. Luckily, this didn’t happen at all and this was just as hard to put down (seriously, don’t start the last 100 pages unless you can finish in that sitting!). I did not reread any of Pure before starting this and was fine. It did a great job of reminding you of what happened without retelling it too much. The characters get developed even more in this book. Every character has a purpose and a history and it influences everything they say and do. They are also all incredibly smart, which is so nice! I have said it before, but intelligent characters in young adult books is something I love. Their plans aren’t always perfect, but they actually make plans and use strategies. It makes the rebellion feel real and that they can actually change the world. This world is so well thought-out. Baggott does not leave out any details, which makes teh world feel so real. As i said in my review of the first book, I can see something like this happening, so it is all the more terrifying, in an awesome way. I have said before that I love it when books jump to different perspectives and this series does it best. It follows several of the characters and lets you see so many ways of seeing the world. Pressia continued to be my favorite character. She is so strong and a little stubborn. She is so tough, brave, and even deadly, yet she is still loving and cares about all of those around her. She admits she is scared, but goes on and puts her neck on the line for everyone. She may be my favorite character. She also gets some romance in Fuse, which I actually liked because it shows that it may be possible to find love in such a bleak world. That isn’t to say that all the others characters aren’t amazing also. I thought Partridge’s story was suspenseful and even made me tear up. He is forced with unthinkable choices and had me on the edge of my seat until the very last page. If anything like this ever actually happened, I would hope he was on the side of the people. This series is incredible and I am very eager to read the last book. So much has happened and seeing the consequences of these events is going to be incredible. I read a lot of series and it is so hard to pick my favorite, but I think this might be it. I don’t know though since Legend is VERY close. Do you want to win a hardcover copy of the book? In 2011, I said that Ruta Sepetys debut Between Shades of Gray was one of the best books I read that year. Well I read this book in 2012 and it was one of the best books of that year. 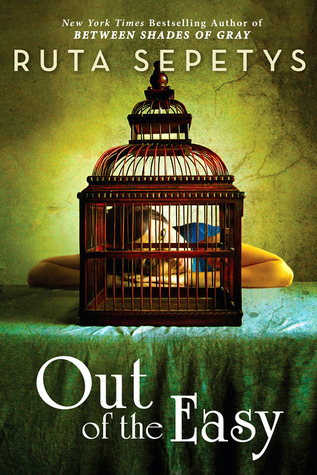 I was afraid that somehow the beauty of her debut couldn’t be matched, it was a perfect book. The good news it can, and it was with this. I think it would be impossible to not fall in love with Josie. She comes from a tough background, but she is smart, caring, and ambitious in the best way possible. She works hard and cares about all of the wonderful people in her life. She knows that she can’t do anything without them, but if there is something that will put those she loves in danger, she will still try. She is not without her faults, but those faults make her who she is and make her feel so real. That isn’t to say she is the only character that makes this book so great. The madam her mother works for is like no other. She is feisty and brash, but she loves everyone who works for her and loves Josie as a daughter, which is a good thing since Josie’s mother is such a reprehensible character. The things her mother would say to her filled me with so much rage. There is so much in every single character, they are so fleshed out that I could write a paragraph about each one and why they add to this beautiful book, but I won’t because I want you to read and find them for yourself. Great characters would be nothing without a great story. There is mystery and suspense. There is some romance and relationships. There is grief and growing up. I could not put the book down. I read it in three sittings and each times I found myself saying “Just one more chapter” at least a few times before I finally stopped. It is an exciting story, but it doesn’t have excitement for excitement’s sake. Everything matters. 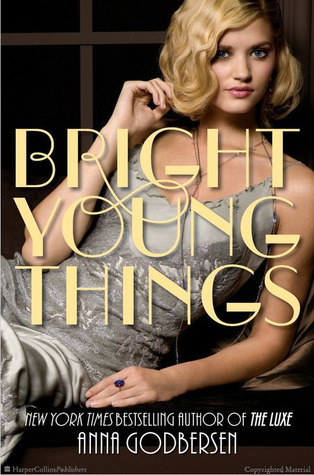 This book is young adult, but like her previous book, it is a young adult book with a wide cross-over audience. Josie is seventeen and eighteen in the book, putting her towards the top of the age range. She talks and acts like a young woman. It doesn’t even really feel like it is a young adult novel, other than that she is a character that young women can relate to and love. To me, it is the kind of book that anyone can enjoy, even if it has a YA label.I know I will pass it on to many people of all ages! If you only add one book that I review to your to-read list, this is the book to add. Why did it take me so long to read this book? I heard about it a long time ago (I added it to my goodreads to-read list in December of 2010) and knew it was my kind of book! Historical fiction, young adult, and three strong female characters, what more could I really ask for? It was just so fantastic. So much so that I have the second book in the series sitting next to me (but i have two books I need to read before I get to it). All three characters had great voices and stories. They were very different from each other, which was great because it made the jumping between the stories so much better. The stories overlapped, but all three also had their own stories. If this book was published now, it might be labeled as new adult – and rightly so. They were all 17 or 18 and dealing with issues and goals beyond the usual young adult book. There aren’t really adult issues in it other than drinking, but it wasn’t underage at the point because all drinking was illegal. If you are looking for a fun escape into Prohibition New York, look no further than this book. It will take you away to another place and time and show you adventure, love, and friendship. What is a book has been on your to-read list for a really long time?